Challenge families, dens or individual boys to guess how many medals various Olympic athletes have won. Make a short list of famous Olympic athletes. Then give the list to Cubs (and families) and have them figure out sports and number of medals. You may wish to supply the answers in lists of all the sports and the numbers of medals. They can then select from the list. Gather photos from past Olympics (if needed, you can get them online) Create a matching game and see which boy, den or family can guess the most correct matches of photos to labels – use dates, names or type of event as the label. 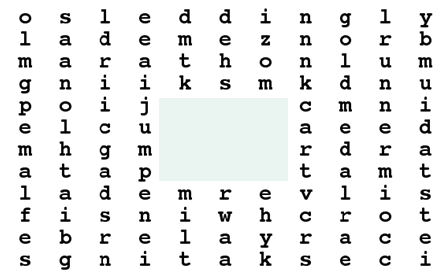 Look for sixteen words related to the Olympic Games hidden in this puzzle. Names may be found up, down, across or diagonally. Rope skills are fun for everyone while promoting the value of physical activity and teamwork. This is a group version of jumping rope to try. Two people turn a fairly long, substantial rope, one at each end. The remainder line up and follow each other, in quick succession, to skip, jumping one, two, or three skips and then joining the end of the queue again. A more complicated variation is to use two ropes. (Dutch Ropes), the turners hold a rope in each hand and turn the ropes alternately. It is quite a feat to skip over the two turning ropes without getting fouled up. Match the following terms with the proper sports by writing the number of each term in the blank by the sport it pertains to. Some terms may pertain to more than one sport. The word or words in capital letters can be rearranged to make the name of a sport. Have half of the cards with the names of famous athletes and half of the card with the sport for which they are noted. Hand out the cards as the people walk in and have them find the person with the card the matches theirs. The table is shown with the athlete next to the sport in which he competed. What sport do the L. A. Lakers play? The Yankees are a baseball team from which city? What is the name for the football team in Dallas, Texas? The Tampa Bay Buccaneers play ice hockey? What is the name of the basketball team that Michael Jordan played for in Chicago? What sport do the Detroit Red Wings play? Allen Iverson used to play for the Philadelphia '76ers. What sport am I talking about? True or False, the Miami Dolphins are a football team?